We don’t arrest or perp walk CEOs in this country but at least we get to see a few “doctor feelgoods” take the walk of shame. If you were looking for the changing face of drug enforcement, here it is. 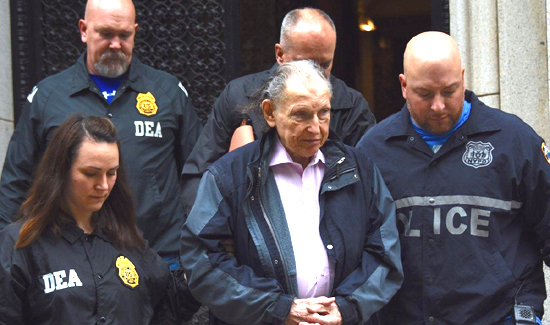 A Manhattan physician who describes himself on his website as a “good old-fashioned family doctor” who even makes house calls was busted Monday for dishing out thousands of unneeded painkiller prescriptions — allegedly knowing some patients were hooked on the dangerously addictive pills. Brooklyn federal prosecutors said Dr. Martin Tesher wrote more than 14,000 oxycodone prescriptions in a Dr. Feelgood act that lasted almost five years. The prescriptions allegedly generated 2.2 million oxycodone pills — $20 million worth of opioids, according to authorities. New York City — and the country — is in the grip of an opioid epidemic. The Daily News, in its recent “Opioid Nation” series, said there were 1,075 opioid-involved deaths in the five boroughs in 2016, up from 753 the year before — a 43% increase. The rate of fatal opioid overdoses in the city, including from heroin and pain pills — tripled from 2000 to 2015, according to city and state data.